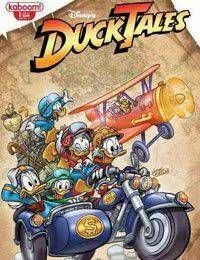 DuckTales is back! The hit Disney Afternoon TV show makes a splash this month as an all-new, original ongoing comic book series! Written by the creator of the Epic Mickey video game, Warren Spector, and illustrated by the fan-favorite Disney duck artist Miquel Pujol, this is the latest and greatest of the Disney Afternoon Revolution that might solve a mystery, but will definitely rewrite history! Existing within the same continuity as BOOM!s hit series Darkwing Duck, find out why life is like a hurricane!